Needing tree removal in Ludington? Homeowners know of the best tree service company to call. Totally Trees has been serving customers in the Ludington areas for over the past 10 years. Have your tree removal performed by our professional teams. Tree removal from power line areas. Why Choose Us For Your Tree Removal? Did we mention that we LOVE our jobs! We actually enjoy planning and beautifying your property. We constantly maintain our equipment. This helps to ensure that it runs it’s best. Keeping the project running smoothly, saving you money. This can help keep any issues to a minimum during your Ludington tree removal project. Not maintaining your equipment, or using it improperly can cause your project to take more time than it really should. We only use the best brands in tree service equipment. Call Totally Trees if your property may be in need of tree removal. Wind and Winter can damage trees on your property. Have a professional tree removal company give you an estimate. Have your dead or decayed trees removed. This makes your property safer, giving you piece of mind. In addition, we love a challenge. We have been called by other tree removal companies to assist them with difficult and dangerous tree removal. Cut your own tree and it’s on your house? Totally Trees has seen that. Where most failed tree removal ended, we were called to help save the day. 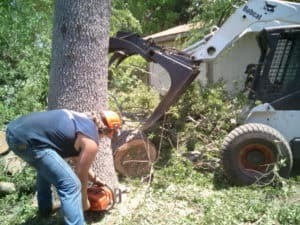 Ludington tree removal is one of our number one calls for service. Our customer service as a tree removal company, is unsurpassed. Professional field crews, proper equipment, and a safely planned project, can help keep minimal presence on your Ludington property. Give us a call today if you are interested in getting your free quote. You can also use the form below to request your free quote.